Celtic face Aberdeen in the Betfred Cup final on Sunday as they attempt to win a seventh consecutive domestic trophy. Here are the key talking points ahead of the Hampden clash. Scott Brown has not started a game since suffering a leg injury against Hibernian on October 20 but the Celtic skipper made his comeback in the final 13 minutes of Thursday's Europa League win over Rosenborg. The 33-year-old will be determined to lead his team to another trophy but manager Brendan Rodgers has an embarrassment of riches in midfield. Callum McGregor has excelled in a deeper role during Brown's absence and Ryan Christie has been a revelation further forward. Scott Sinclair scored the winner in Norway, Tom Rogic has proven to be a key player in big games, James Forrest is in the form of his life and Olivier Ntcham is also pushing for a start. Aberdeen centre-back Michael Devlin has only been given an outside chance of making the final after being hit by a foot injury while on Scotland duty. His likely absence would be a major blow as the Dons are already without another two central defenders, Mark Reynolds and Tommie Hoban. Regular left-back Andrew Considine lined up there in last weekend's 3-0 defeat by Motherwell and manager Derek McInnes would have little choice but to field a flat back four if Devlin does not make it. Scott Bain will start in goal for Celtic after playing in the three earlier rounds. The former Alloa and Dundee player, who started his career at Aberdeen, played in some big games last season, notably a 3-2 win at Ibrox and for Scotland in the Azteca Stadium in Mexico. Bain has only conceded one goal in four matches this season and Rodgers has shown his confidence in the 27-year-old by handing him the gloves ahead of Craig Gordon. Aberdeen strikers James Wilson, Stevie May and Sam Cosgrove only have five goals between them this season and such statistics might ensure they start with only one up front. McInnes has preferred a target man against Celtic at Hampden but Cosgrove is relatively inexperienced at the age of 21. The Dons might need to rely on midfielders for inspiration in front of goal, such as semi-final hero Lewis Ferguson and top-scorer Gary Mackay-Steven, who is on six for the season. 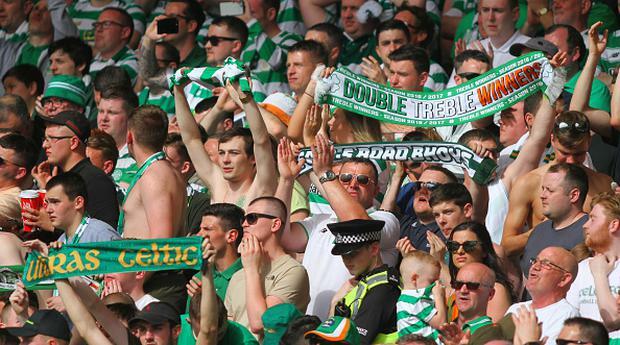 Celtic scooped an unprecedented double treble last season and they are looking to extend their record run of domestic trophies by making it seven out of seven under Rodgers. If they do so, then 'triple treble' will enter the Scottish football lexicon.